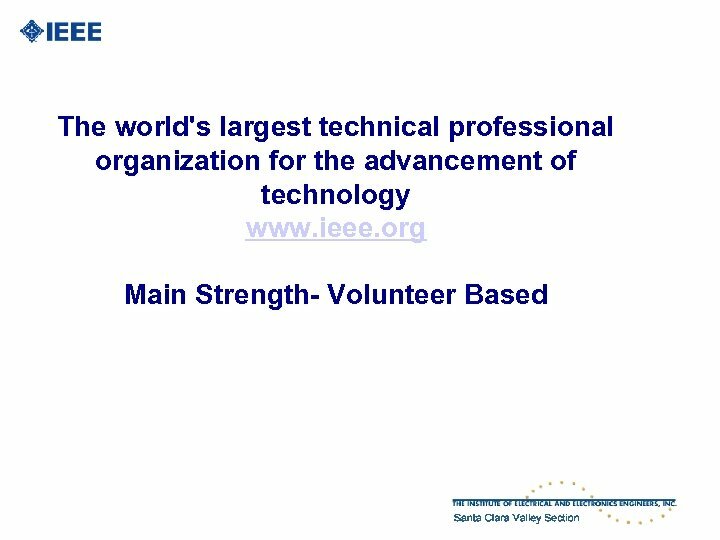 Senior IEEE Members- See next few vu foils IEEE Fellows: Highest level achievements in Electrical /Electronic/Software with huge contributions in the field. Each year very limited #s( up to 0. 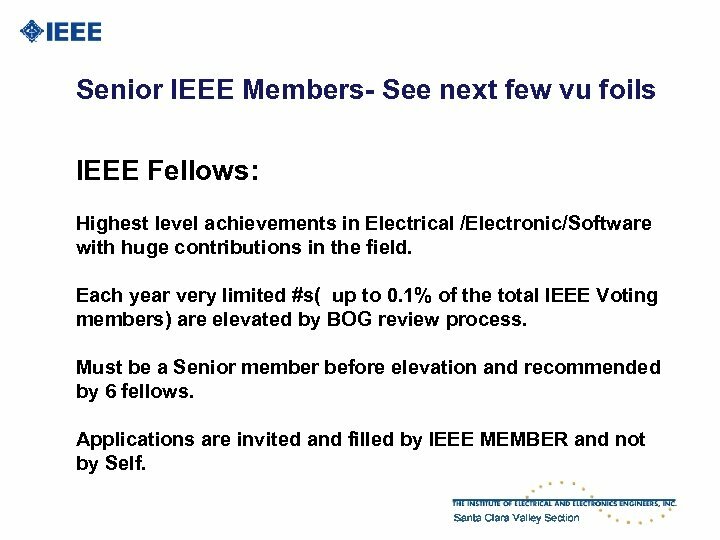 1% of the total IEEE Voting members) are elevated by BOG review process. Must be a Senior member before elevation and recommended by 6 fellows. Applications are invited and filled by IEEE MEMBER and not by Self. 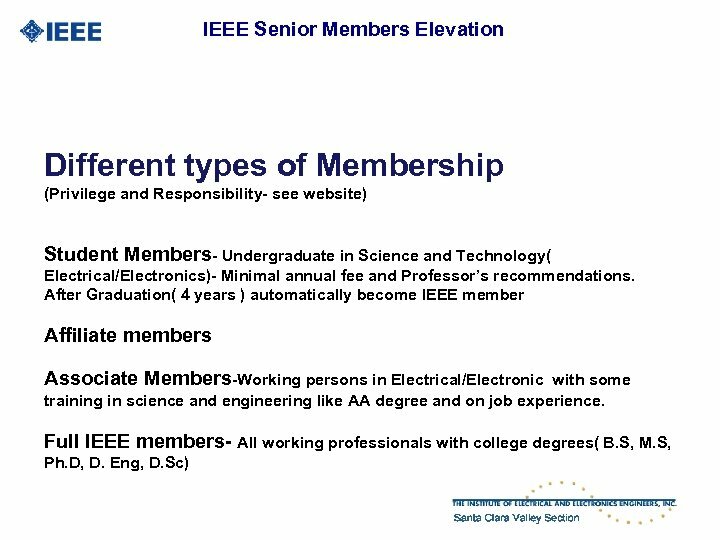 IEEE Senior Members Elevation Benefits by becoming Senior IEEE Member 1. Professional recognition by your peers for technical and professional excellence and path for IEEE Fellow in future. 2. 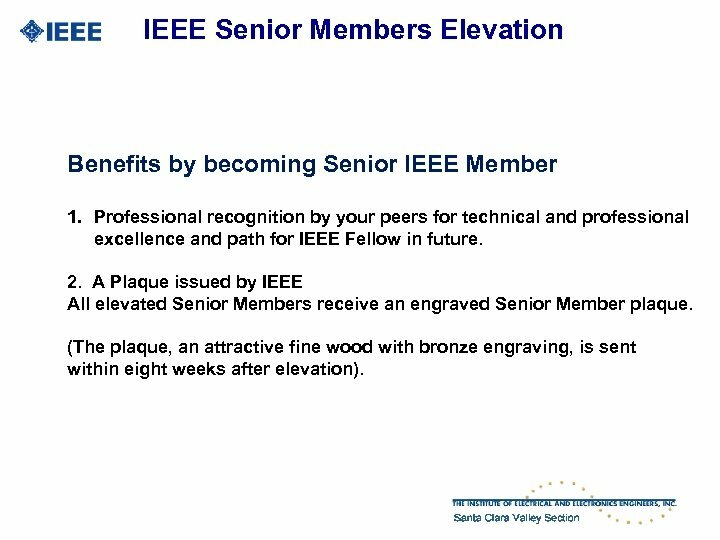 A Plaque issued by IEEE All elevated Senior Members receive an engraved Senior Member plaque. (The plaque, an attractive fine wood with bronze engraving, is sent within eight weeks after elevation). 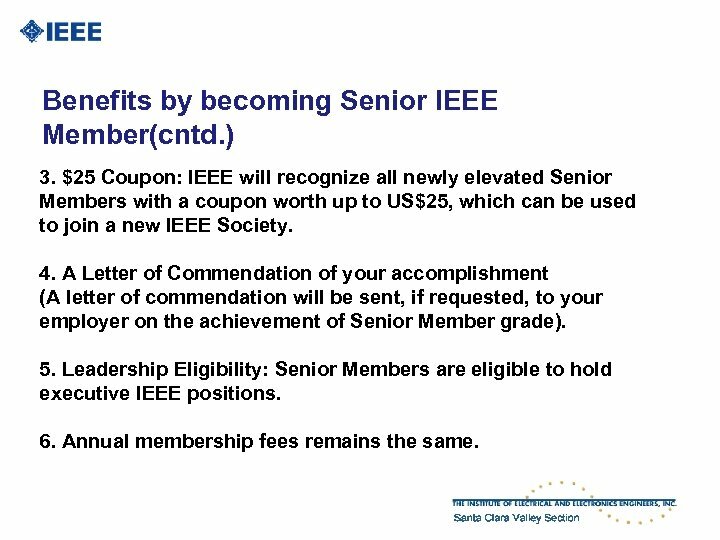 Benefits by becoming Senior IEEE Member(cntd. ) 3. $25 Coupon: IEEE will recognize all newly elevated Senior Members with a coupon worth up to US$25, which can be used to join a new IEEE Society. 4. A Letter of Commendation of your accomplishment (A letter of commendation will be sent, if requested, to your employer on the achievement of Senior Member grade). 5. Leadership Eligibility: Senior Members are eligible to hold executive IEEE positions. 6. Annual membership fees remains the same. 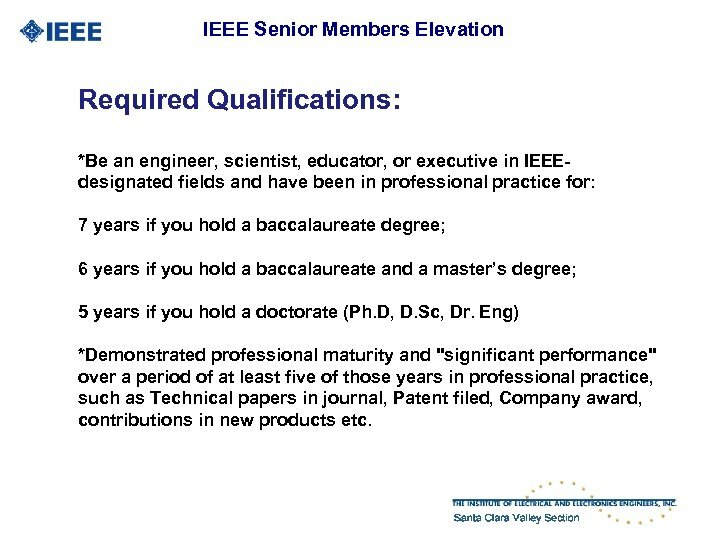 IEEE Senior Members Elevation Required Qualifications: *Be an engineer, scientist, educator, or executive in IEEEdesignated fields and have been in professional practice for: 7 years if you hold a baccalaureate degree; 6 years if you hold a baccalaureate and a master’s degree; 5 years if you hold a doctorate (Ph. D, D. Sc, Dr. Eng) *Demonstrated professional maturity and "significant performance" over a period of at least five of those years in professional practice, such as Technical papers in journal, Patent filed, Company award, contributions in new products etc. 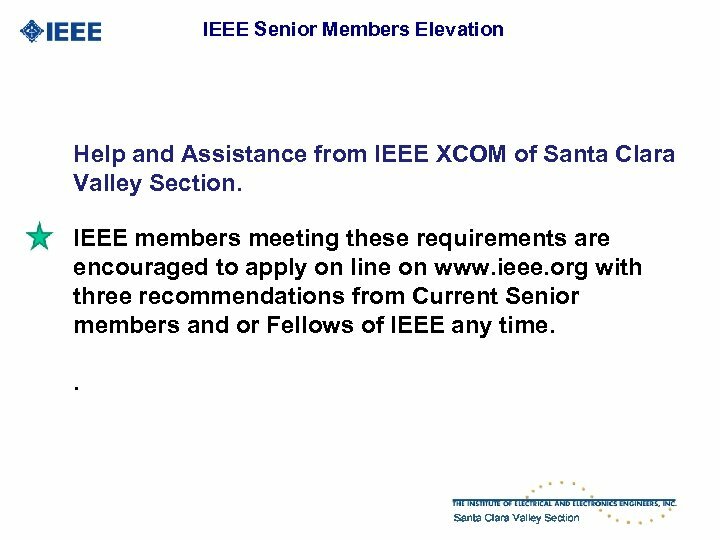 IEEE Senior Members Elevation Help and Assistance from IEEE XCOM of Santa Clara Valley Section. 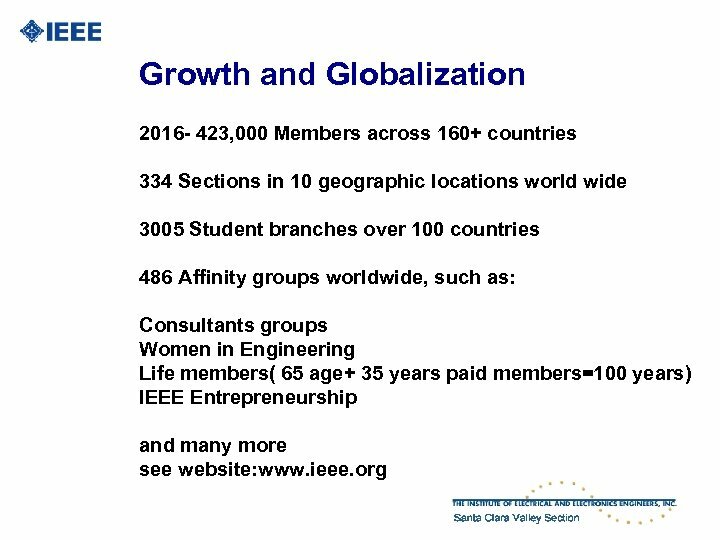 IEEE members meeting these requirements are encouraged to apply on line on www. ieee. 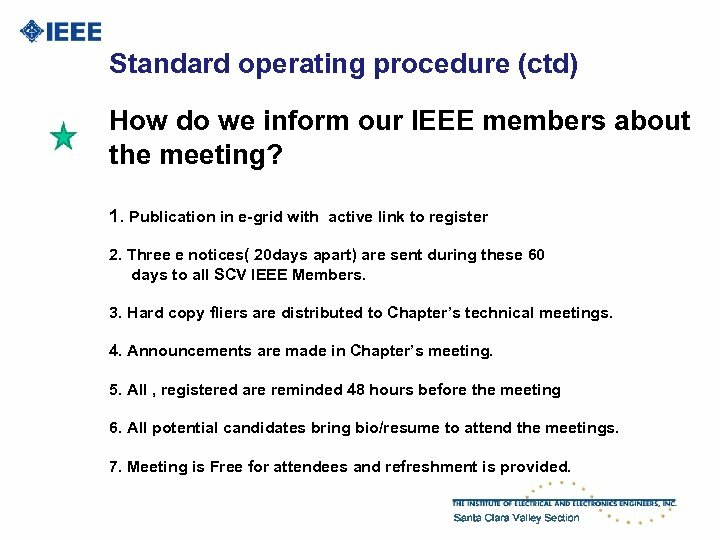 org with three recommendations from Current Senior members and or Fellows of IEEE any time. .
Standard operating procedure (ctd) How do we inform our IEEE members about the meeting? 1. Publication in e-grid with active link to register 2. 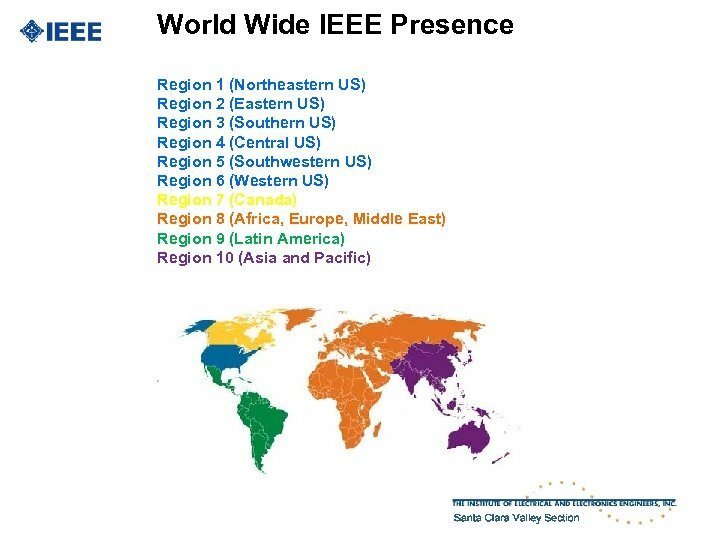 Three e notices( 20 days apart) are sent during these 60 days to all SCV IEEE Members. 3. Hard copy fliers are distributed to Chapter’s technical meetings. 4. Announcements are made in Chapter’s meeting. 5. 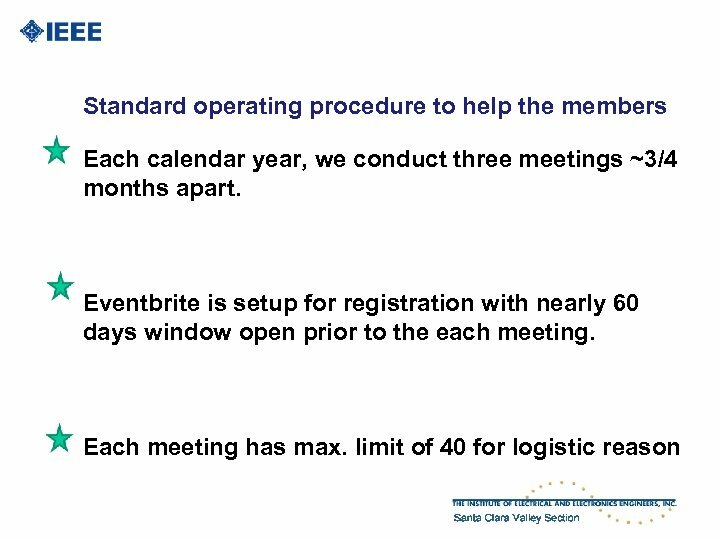 All , registered are reminded 48 hours before the meeting 6. All potential candidates bring bio/resume to attend the meetings. 7. Meeting is Free for attendees and refreshment is provided. 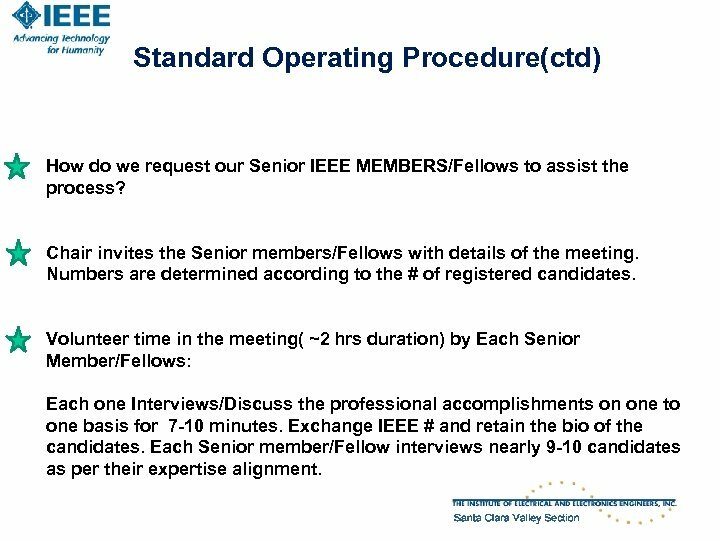 Standard Operating Procedure(ctd) How do we request our Senior IEEE MEMBERS/Fellows to assist the process? Chair invites the Senior members/Fellows with details of the meeting. Numbers are determined according to the # of registered candidates. Volunteer time in the meeting( ~2 hrs duration) by Each Senior Member/Fellows: Each one Interviews/Discuss the professional accomplishments on one to one basis for 7 -10 minutes. Exchange IEEE # and retain the bio of the candidates. Each Senior member/Fellow interviews nearly 9 -10 candidates as per their expertise alignment. 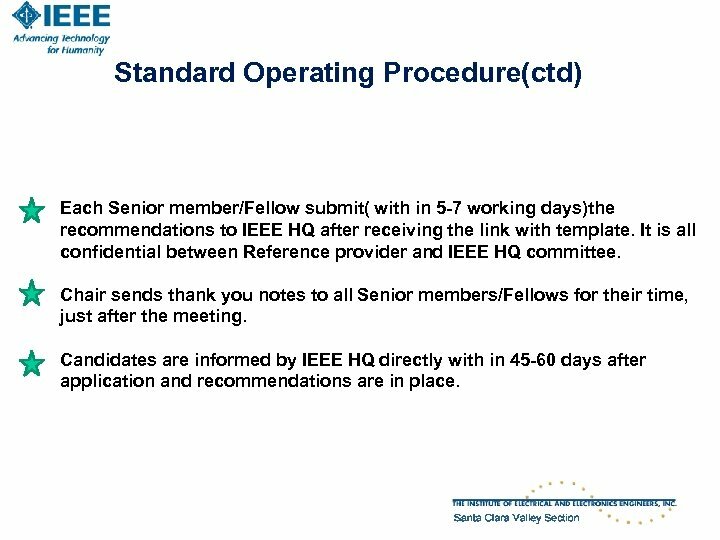 Standard Operating Procedure(ctd) Each Senior member/Fellow submit( with in 5 -7 working days)the recommendations to IEEE HQ after receiving the link with template. 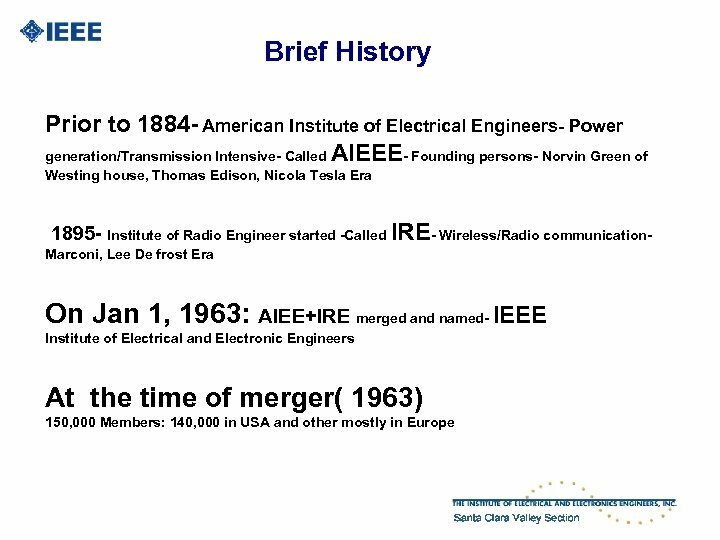 It is all confidential between Reference provider and IEEE HQ committee. Chair sends thank you notes to all Senior members/Fellows for their time, just after the meeting. Candidates are informed by IEEE HQ directly with in 45 -60 days after application and recommendations are in place. 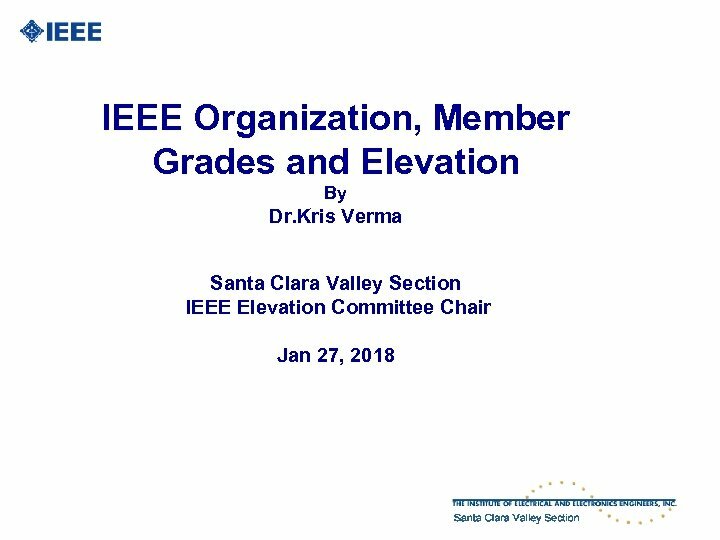 IEEE Senior Members Elevation Status as of 01/27/18. During 2016, 52 Members got Elevated with our assistance. 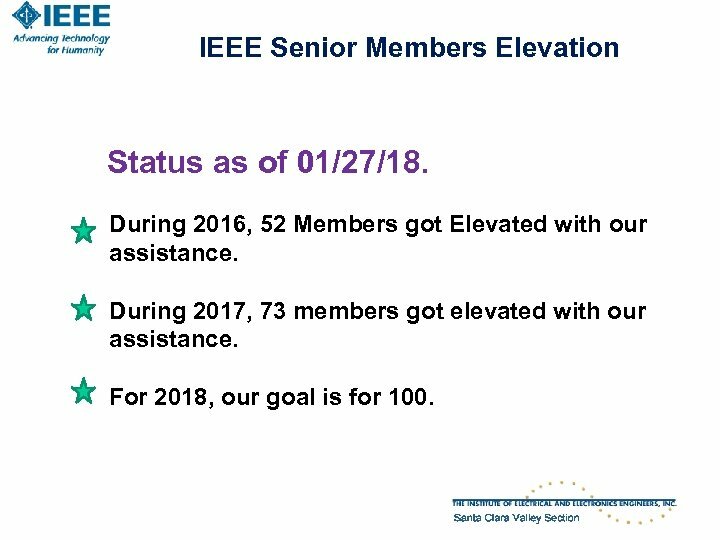 During 2017, 73 members got elevated with our assistance. For 2018, our goal is for 100.